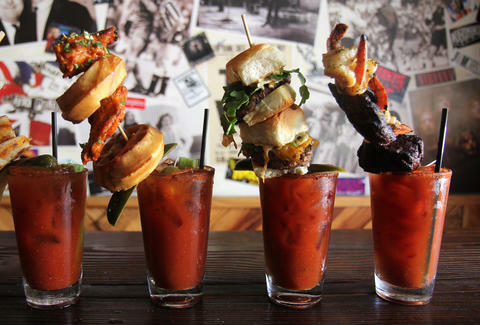 LA's Spare Tire has mastered brunch with its totally over-the-top Bloody Marys, which come in four different variations that'll leave your thirst and hunger satiated, unless you're some kind of monster. The different “toppings” are more like full meals, and include the likes of chicken & waffles, grilled cheeses, and pub sliders. The most popular is the surf & turf, served with four prawns and 4 oz of hanger steak. Check out the video from FoodWithSoy, and then get on your, uh, Mary way to a fantastic brunch for only $14.